On the late summer afternoon I visited composer Gina Leishman, we couldn’t meet in her apartment because it was under repair. A pipe had burst so a friend was loaning her apartment to Gina for a few days; one of those little studio apartments that New Yorkers manage to transform into what seems like a sprawling flat. Nestled on a similarly charming tree lined street, it had the same cozy feel as her old apartment in the West Village, only a stone’s throw from the historic landmarks and cultural establishments that Greenwich Village has to offer. She left me perfect instructions on how to use the intercom but after several unsuccessful attempts I gave up and called her. I apologized for being a nuisance but Gina couldn’t have cared less. I was received with a big hug and then we ascended the stairwell, briefly catching up on each other’s lives. Her arrangements are reminiscent of French composers like Satie and Debussy. But there is a particularly British sensibility about them as well. This becomes perfectly clear when she sings her arrangement of “Merry Month of May” and the folk song “The Golden Vanity.” Some of the pieces on her 2010 album Bassless Rumors remind me of Brahms’ “Trio in A minor for Piano, Clarinet and Cello.” Her melodies could be described as haunting because they are memorable and moody but that’s an oversimplification. Gina’s music is also imbued with subtle rhythmic syncopations that toss her harmonies about. The effect is like when one is at the laundromat, whiling away time, eyes front, hypnotized in spin cycle. There have been several combinations of the Kamikazes but the main faction includes fellow co-founder Doug Wieselman on reeds, trumpeter Steven Bernstein, saxophonist Peter Apfelbaum, tubist Marcus Rojas, trombonist Art Baron and percussionist Kenny Wollesen. The first time I heard this version of the band in concert I was moved by their opening piece “Morning in Bhutan” which unfolded like a magic carpet being rolled out, the flap of its fringe delivering glimmering notes akin to precious stones to my ears. This was the real thing: the Kamikaze’s attempt at capturing a mystical experience in sound, to take us on a journey, revealing musicians who are devoted to creating deeply refined music. Let’s go back a decade or more ago to her old apartment in the West Village. It was at one of her winter solstice soirées. Upon entering the living room I noticed a rack of wine glasses, tiered on a platform as if they were meant for a carnival stall bean bag toss. The glasses weren’t for drinking, they were instruments for music making, purposefully designed for a shimmering sonata of some kind. I yearned to hear them sing in that warm and friendly room, resonating in perfect pitch with the seasonal scent of mulled wine. Tiered glasses are just one of the many instruments Gina plays. Piano is her first instrument and she’s comfortable on accordion, alto and baritone saxophone, bass clarinet, bandoneon, harmonium, and mandola. When singing she often accompanies herself on the baritone ukulele. Her list of accolades and accomplishments is as remarkable as her multi-instrumental talents. She has scored original compositions for theater, opera, dance, film, TV and the concert stage. Gina got her degree in early music at Edinburgh University, and wasn’t long before she landed a job at EMI to be the liaison to David Munrow, an early music pioneer in the 1970s. Our conversation occurred before the Kavanaugh hearings would expose us to the vilest kind of arrogance ever displayed by a future supreme court nominee. Despite the fact I was raised by a fiercely independent single mother among two feminist step-mothers, it brought things to the surface in my own self that I had never recognized. At the heart of the #MeToo era I was curious to discuss this with Gina and find out how she’s managed to deal with an overwhelmingly male dominated music business. Gina’s thick skin certainly came in useful in her youth. She shared several anecdotes with me that sound thrilling to say the least. Like the time she spent 6 months in 1970’s Belfast during the height of “the troubles.” Or when she lived with King Crimson’s violinist in a squat in London, the same period when a friend asked her to be Musical Director for a new theater. He had acquired the rights to the Brecht/Eisler songbook and they built a theater out of nothing, in an old disused taxi meter factory in Paddington. It was while she was a street performer in London that Gina acquired the skills to become a member of the famous musical-comedy, juggling-acrobat troupe The Flying Karamazov Brothers. Gina recalls the first time she met them, while in performance at a country fair in Eugene, Oregon. “The sound got so loud we had to stop playing. This procession came in through the meadow. This marching band, clowns and jugglers and a bunch of musicians playing crazy marching band music unlike any normal marching band music. And I realized that I wanted to know who these people are. And they were the Karamazovs.” They reminded her of a similar group she knew in England, “Oh, I recognize this. And it turned out that a few of them were quite good musicians.” This is when she met Doug Wieselman and before long they are asked to do a Broadway show. No matter how much dialogue David Gordon casts about in his productions, they’re usually still listed as upcoming attractions under “dance,” and dance critics regularly review them. His latest work, Uncivil Wars: Moving w/Brecht & Eisler, like his brilliant 2004 take on Shakespeare, Dancing Henry V, has a great deal of text, and much of it not by Gordon. But even though almost all the performers in Uncivil Warsare actors, not dancers, that word “moving” in the title is telling. Gordon, an important figure in postmodern dance since the 1960s, has taken Bertholt Brecht’s little-known 1931 play The Roundheads and the Pointheads, as translated by the Voice’s Michael Feingold folded in allusions to Brecht’s life and ideas, and turned it into a whirling carousel of political ideologies. This uncannily timely scenario about war-mongering, greed, and discrimination is in almost constant motion. 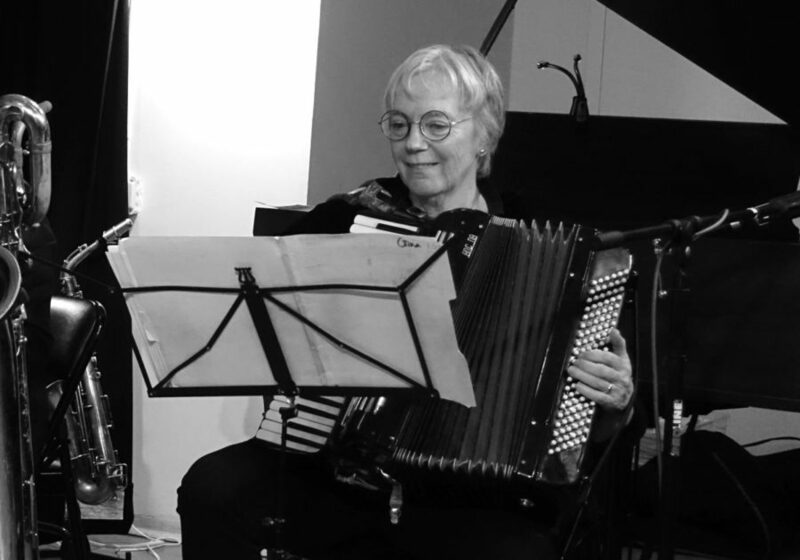 Gina Leishman as Brecht’s musical collaborator Hanns Eisler is the only one of the eight principal performers with a single role; she plays piano, organ, and accordion, sings and confers with Brecht (Valda Setterfield). The others slide in and out of two or three roles each, donning wigs or hats or wimples on the run—sometimes stowing these in the pockets of their black coveralls. They arrange and disarrange chairs and tables, wheel ladders and jail-cell grills around, and handle what could be a ballet barre as if it were a swinging door. They march. They stamp their feet and clap their hands in synch. Most of the time, they deliver their lines briskly—especially Setterfield—with a kind of on-rolling rhythm. Words announcing song titles (in German), credits, and newspaper headlines dance onto a couple of video screens or the back wall (credit Dean Moss and Ed Fitzgerald for the media manipulations). During a trial with Setterfield as judge, a projected transcript is rendered in text-message shorthand to comic—and thought-provoking—effect. Brecht took as a model for The Roundheads and the Pointheads Shakespeare’s dark comedy Measure for Measure (whose plot, as Brecht-Setterfield tells us, can be traced back through a slew of related 16th-century stories and dramas). The tale of a cruel deputy whose schemes are deflected by the other characters by means of a variety of disguises and deceptions became in Brecht’s hands a didactic political satire. Gordon began working on his version of the play in 2003, and the re-election of George W. Bush in 2004 galvanized him into pushing forward with it. Its relevance is striking. The country of Yahoo has a huge deficit and a surplus of corn; the people are restless. The Vice Viceroy (Davis Duffield) slyly suggests that “war makes new markets.” When the Viceroy goes off on a trip, leaving the VV in charge, the local newspaper helps foment antagonism between the original inhabitants of Yahoo (the roundheads, known as Czuchs) and the recent immigrants (the pointheads, known as Czichs). Former friends become enemies; Czichs are hunted down (“Here, czich, czich!” call their pursuers). Trials figure in Brecht’s play (a horse is stolen, and justice miscarries to an absurd degree). Gordon has inserted a parallel: Eisler and Brecht’s being summoned (separately) to appear before the House Committee on Un-American Activities. Brecht would have been labeled an unfriendly witness—an 11th joined to the Hollywood Ten—had he not fled to Europe. One factor that gives the production its bewitching, almost dizzying fluidity is the multiple casting. The confusion that sometimes ensues as to who’s being whom now adds to the farcical aspect of disguising. Is Michael Rogers of the resonant voice being the Czuch slum landlord now or the wealthy Czich landowner, De Guzman? Wait, he’s wearing a pointy little headpiece; he must be De Guzman. If it weren’t for the Czichish peak under the wimple, it might take us several seconds to realize that Charlotte Cohn is now De Guzman’s sister Isabella, who’s taken refuge in a convent, and not Nana Collas, a roundhead farmer’s daughter turned whore; when pretending to be Isabella, she wears a wimple that sits lower on her head. Cohn sings wonderfully both characters’ bittersweet songs in the cabaret style that Eisler and Brecht devised, and all the performers—singly and together—are splendid in the meditative or vituperative songs. Duffield is equally fine as both the vicious Vice Viceroy and the bewildered, victimized Farmer Lopez. Norma Fire takes on the roles of his wife and a feisty lawyer and plays both with distinction. It’s entertaining to see Duffield and David Skeist—who’s oafishly naive and greedy as Farmer Callas, the roundhead horse stealer—jumping up and down as two gleeful nuns who need—and get—a reprimand from Mother Superior John Kelly. (Kelly is also terrific as the town’s resigned and practical madam.) Setterfield and Leishman, with their commentary and Leishman’s accompaniment for the songs, hold the piece together and link it to this country’s present ills. In the end, the actors are joined by the chorus of volunteers from the Montclair community, and all of them, clustered irregularly on chairs, stamp and clap out a long, engrossing, rhythmically complicated sequence. It sends a strong, if oblique message—suggesting that pigeonholing of people by gender or race, or as, say, red-staters and blue-staters, is a divisive oversimplification of our differences and that harmony is within our reach. Provided our moral compass can again find its true north. Under the direction of the wily postmodernist David Gordon, “The Roundheads and the Pointheads,” Bertolt Brecht’s 1931 Marxist parable about how politicians distract from the conflict between rich and poor by focussing on less important differences, takes on new life. Scenes from the biographies of Brecht and the composer Hanns Eisler are effectively integrated with their songs, and explanations of Brecht’s theatrical theories are but one of the ways those theories are playfully enacted. The ensemble, which includes Valda Setterfield and John Kelly, is so uniformly excellent, so charming, that the overriding effect is not alienation but pleasure. Gina Leishman revels in eclecticism, cherishing the journey as much as the destination. She plays saxophones, piano and bass clarinet as well as atypical wares like accordion, ukulele and harmonic glass. Best known to jazz listeners as the co-leader of the perennial horns-and-drums ensemble Kamikaze Ground Crew, she’s also worked in musical theater as a performer, musician and composer; a cabaret vocalist; a composer for television and film and a voice-over specialist. Typically, her two recent CDs are stylistically diverse. Postcards From the Highwire is the fifth Kamikaze album and the second with the “east coast” lineup: trombonist Art Baron, tubaist Marcus Rojas and drummer Kenny Wollesen joining longtime tenor saxophonist Peter Apfelbaum, trumpeter Steven Bernstein and co-leading multi-instrumentalists Doug Wieselman and Leishman. The virtuosic ensemble builds episodic pieces drawing on jazz, rock and other influences while jettisoning the manic quirkiness of their earlier work. After rollicking group passages and exchanged solos, Apfelbaum’s “Shotgun Bouquet” untethers Rojas from the bass role, encouraging his sonic freestyle for a rousing finish. The fleet Dixie-swing of Bernstein’s arrangement of Chu Berry’s “Christopher Columbus” launches Apfelbaum and Baron’s growling mute over the traditional form. Leishman’s delicate piano leads over the dynamic terrain of her “Love-Go-Round”, while she wields ukulele with spare accompaniment on “O Mistress Mine”, her setting of Shakespeare to music and warm singing. Kamikaze records have always featured a Leishman vocal, but only in recent years has she developed and documented her singer-songwriter material. In My Skin is the second installment of her songbook, the breezy tunes mostly written on and propelled by baritone ukulele within an unusual string quartet of guitar, violin and bass. Lyrically, songs like the title track, “The Scenic Route” and “Girl With a Curl” are bemused personal reflections on themes which one can relate to like finding identity. On the latter, violinist Charlie Burnham colors and reacts to the words with clever bowed and plucked retorts. The languid ballad opening of “Food First” later quickens behind guitarist Matt Munisteri’s loping bluesy runs and bassist Greg Cohen’s emphatic thrum, his round tones a steady anchor. Leishman’s incredulous commentary on our wars forms “Nightwind”, boasting the unmistakable twang of guest guitarist Marc Ribot’s prodding fills. Leishman charmingly unfurls her narratives, revealing another stop along her picturesque musical road. For more information, visit ginaleishman.com. Kamikaze Ground Crew is at MoMA Sculpture Garden Aug. 21st. Singer (and multi-instrumentalist) Gina Leishman’s music brings to mind Tom Waits. Well that is, except for the voice. She indeed has quite a pretty one. In My Skin is the second to feature her music, songwriting, and vocals. Bed Time (c’estquoi music, 2004) shares some of the same guest musicians: bassist Greg Cohen, guitarist Marc Ribot, and drummer Kenny Wolleson. Here, the violin and guitar chores are taken up by Charlie Burnham and Matt Munisteri. Like Waits, Leishman has a knack for a turn of phrase. Her lost loves don’t deter her merriment, even when she sings “He said I feel I’ve known you all my life/She said I know/He said I think I love you/And by the way have you met my wife. And, like Waits, she has the good sense to strip her arrangements down to this simple string quartet. Leishman’s affectionate ukulele playing is accompanied by sparse violin, bass, and guitar. Before Leishman fronted her own band she was a co-founder of the septet Kamikaze Ground Crew, with Steven Bernstein and Doug Wieselman. She co-leads Msr. Wau-Wa band, a quintet dedicated to the songs of Bertolt Brecht, and can also be found working in theater and, has written the opera Burning Dreams. Her vinegary lyrics are for self described hammock songs, strummed and tasting somewhat acerbic. Love is sometimes lost; mostly the femme fatale is gone before she loses the game: “Here today gone tomorrow/Sometimes it rains sometimes shine/And so when I’m pining or feeling blue/I pack my bags and I don’t think of you. Leishman’s self-referential portrait, “Girl With A Curl, is a wispy tale of a girl’s playing with music, musicians, and among men. The child’s song “Nightwind learns the lessons of 9/11: “Cries on the night wind/Echoes of empires’ fall/Ours in the making/Sighs on the night wind/Falling of buildings tall/There for the taking. The favorite composition here might be the ancient wisdom of “Food First (Love Later), and she wasn’t born Italian! Here’s a sample… You can try and eat your dreams/But they’ll leave you wanting more.